1. As a school teacher, as well as a mother, but more from the standpoint of a teacher....I WISH EVERY PARENT WOULD TEACH THEIR CHILDREN HOW TO BLOW THAT BIG, GREEN BOOGER FROM THEIR NOSTRIL...it really can make a teacher gag when it just sits there... OH! And on this note...let's all teach them that picking their nose is not cute and NO ONE wants to see it-especially in this day when swine flu runs rampant!!!!!! 2. Learn to laugh. This is two-fold. Learn to laugh at themselves...meaning don't take themselves too seriously. But also learn when it is appropriate to laugh. We don't laugh AT people, we laugh with them. 3. This is last, but certainly not least. This should actually be my number 1, 2 and 3 for me to teach my youngest child. LEARN TO WHISPER! And I don't mean in church, or at weddings or whatnot. I mean, when they want to ask you why someone is large, they whisper it...Or when a friend with a lisp sits down beside you to talk parenting tips and they want to know why they spit when they talk...they whisper (praise the Lord that the friend heard "why are you sitting here to talk? ")...Or when they walk up to the casket at a funeral (even though you have asked them to please stay in the back with a friend of yours) and they ask you, "Is that the dead guy? "...a whisper would be nice. Those are my top 3...can't wait to see what yours are! Special thanks to Shoplet.com-Purell Hand Sanitizers for sponsoring this blog hop. This is an amazing way to have therapy, for free, and in the process feel a whole lot better about yourself when you see the "not me's" of the other moms....started by MckMama...who may or may not be doing a Not Me Monday today...you will have to jump over to her site to see what she is up to today! Not Me Monday was started to tell some of the more embarrassing or "not for my bloggers to read" moments that you have had recently while writing it as if you did NOT actually do those things. I did not feel foolish calling parents this week to say that school was dismissing early that day because of the rain and water on the roads....all while it was not raining a DROP! I did not feel ridiculous....and I most certainly did not have trouble explaining the decision to dumbfounded parents. I did not learn a new word from my three year old this week...."glitterly"...I do not believe it has the same meaning as "literally" and I do not laugh everytime she says it in sentences like, "Glitterly, mom, we live far away from everything." I did not learn a new word from a dear friend of mine this week. It did not come from Gomer Pyle and it did NOT make us laugh hard at Will's football game Thursday when she kept yelling it out. That phrase was NOT "Hoo-dee-hoo"!!!! We did not then become teenagers and start quoting "MadTV" phrases like, "Hey girl, heeeeeeeeey!" I did not laugh so much my sides hurt when it was done. I did not smile huge on Tuesday night when my doorbell rang at 9pm (ok, I did not wonder at first "Whointheworldiscomingtovisitat9pmonaschoolnight") and then run to the front door after I heard my kids yell, "GRANDPA!" My dad did NOT drive way out of his way to see us as he drove from one appointment in Alabama to another in Tennessee. My parents do not live 8 hours away and it has not been almost 3 months since I have seen them. I did not act like a school girl when he showed up. I most certainly did not finally understand why my refrigerator has an alarm on it. I was not cleaning out the old, moldy-penicillin-growing food from the frig when I got to one container and decided it needed to be washed immediately. I never wash anything immediately. I did not hear an annoying beep and begin to yell to my son to find that toy making that noise and TURN IT OFF! He did not then come to the kitchen and point to the frig and say, "Uh...mom....?" That certainly did NOT happen to me. I did not laugh at the Homecoming football game Friday night when a mom walked her ball gown wearing daughter out for the presentation (I really did NOT laugh at THAT)...my daughter who does not love all things princess did NOT say, "Oh mom...why does that princess not have a prince?" What have you NOT been doing lately? What do you think about when you think of faithful? Maybe unfaithful is easier for you to define? Faithful is defined as: "true to one's word, promises, vows, etc." I know it is hard to find much in life lately that is faithful. My retirement accounts haven't been faithful to their projected gains. My state was not faithful to my contract...taking 3 days' worth of pay and calling it a "furlough". My "procedure" this summer was not faithful to the end result, which means I have to go through more testing and more procedures. None of this surprises me though and that shocks me. Faithful is not something that I should expect to let me down. Faithful is not something light or wishy-washy. I don't want people to shrug their shoulders when they look at me and say, "Oh well, she wasn't faithful to what she said she would do." I want to be faithful. But to whom do I look for the living definition of faithful? I have a God who is nothing but faithful. I am firm on that. And yet, it still is hard to SEE faithful in an unseen God. Yes, the renewing seasons show his faithfulness. And yes, regardless of an enormous amount of rain that has fallen on our town in the last 3 days, He is faithful to not let us flood. But to see in real life a faithfulness that trancends time, I ask you to read on. My dad is a great guy. You can read his birthday post I wrote and see exactly how I feel about him. He has always loved animals. Well, let me say, he has always loved dogs. I cannot speak for the rest of the animal population though I do know that he abhors snakes and alligators. I guess technically those are reptiles and not animals...but I digress. Dad loves dogs. And dogs...they are enamored with dad. Especially this one. Meet Georgie. Georgie is my oldest sister's dog. She is precious. She is sweet. She loves to run. She loves to chase squirrels. She loves Dad. And the feeling is most definitely mutual. And when I think about Georgie, I think faithful. She loves my dad, no matter how long it has been since she has seen him. They don't live in the same town. They don't even live in the same state. But when my dad walks through Georgie's door, or when Georgie walks through my dad's door, there is an instant show of unconditional love. Georgie doesn' t ask my dad why he hasn't been around. Georgie doesn't condemn my dad for his lack of time or lack of apparent interest. She just jumps up on him and begins to lick his face and wag her entire back end to show him that she loves him. It is unconditional and it is deep. And you cannot argue it when you see it. Believe me. I have seen it; many times. And Georgie is the picture of our God. Now I am not saying God is a dog (although God is dog spelled backwards...again, I digress)...I would never say He is a dog. What I am saying is that Georgie is a living picture of God's faithfulness to us. We leave him, we stray, we lack interest, time or devotion. We ignore him. We walk out of his presence. And yet, the minute we walk back through his door and ask for forgiveness or the minute we invite him back through the door of our heart, he is there...ready to welcome us back. He wraps us up in his loving arms and holds us close. It is like we have never left. There is no condemnation. There is just love. Unconditional love. So, no matter where you are...he is waiting for you to come back through the door. He won't lick your face, but he will welcome you home. I hope while you read my blog that you see a girl, trying to serve her King while raising a family. I hope His grace, His mercy and His love is abundantly clear when you read. I hope that in someway, I point to Him in what I write. I hope while you read my blog that you will see a normal, working mom with two great kids and a great husband who are just living life. We struggle to fit everything in a day. I lose my temper and sometimes even write about it. :) I am pretty transparent with our everyday life in hopes that it might encourage someone else. I hope while you read my blog that you laugh. I LOVE to laugh and consider it a great day if I have the opportunity to laugh mulitple times. I hope that some of the things I write make you laugh out loud. If you have read anything I have written about my children...you should be chuckling right about now...they make me giggle everyday. So, Welcome, if you are new to my blog...I hope you stick around. And welcome back if you are a frequent visitor. This blog was started by MckMama and it is the BEST kind of therapy for those of us who would never be able to find the time to actually go to therapy over this. If you struggle over the things you said or did this week that you would never tell anyone...this is the place for you!!!!! I did not allow my child to pick her own outfit out for church yesterday which did not match at all. I also did not let her go to church without brushing her hair. I would never allow for that...my mother raised me better than that. I did not laugh out loud when my children were discussing a relatively new church by our house. They talked about how it used to be a big grassy field before the church was built. Then my three year old said, "Yeah...it was a big grassy field and then it growed a church. Right, mom?" I did not just agree with her and laugh all the way to church. I did not put in my headphones the other day and pretend to not hear my arguing children in the backseat. I would never do that, that would dangerous and not very motherly. I would never be that person. I did not show up an hour early for football pictures only to realize that I would now need to kill time and probably feed my children before returning to the field. I did not buy them Burger King for dinner and then proceed to buy myself a Pumpkin Spice Latte from Starbucks as my dinner. I did not then tell my kids that my coffee was my meal in a drink...it was fruit and dairy and possibly a bit of protein...I would never lie to my kids about nutrition and would never try to convince them that my coffee weakness is actually a meal replacement. How about you? What have you not been doing this week? The kids were all so excited...and it was so out of control. The teacher in me wanted it to be a WHOLE lot more organized! Will was talking smack...about what? I have no idea. Perhaps today's game --that was cancelled due to the mosoon that blew in over night...btw we are anxiously anticipating the arrival of the Ark! Come forth Noah! Caroline and her friend Addie like to hang out at the boys football practices--playing with naked barbies and in the dirt and eating food and drinking drinks full of sugar...last night they found each other and immediately began looking for dirt! So the walk began. The boys let the cheerleaders go first, or maybe it was not them being a gentlemen, and just that the cheerleaders got there first! Will was so excited that he lost his hands! Seriously, I have no idea why he did this but he did it the WHOLE time he walked the track. He makes us so proud! After walking around half of the track the kids lined up in front of the inflatable tunnel and waited for the Northwest Bruin Football team to run out for the game....we waited and waited and waited and waited and waited...well, you get the point! Oh joy! They finally ran out of the inflatable tunnel...and then the 5000 youth athletes had to find their parents. THAT was when the fun began!!! Caroline had me purchase two more pom-poms for her so she could cheer Northwest onto victory. After we purchased these pom-poms, we got caught in a crowd of people not moving at all as we tried to head back to our seats. I am short so I kept jumping up trying to see what was happening. I heard about 17 different versions of the story, but what I think happened was a grown man was jumping up trying to catch a small, foam football that the cheerleaders throw after a touchdown and he fell down and through the opening of the bleachers and broke his knee. So be warned...high school football games can be extremely dangerous. The cheerleading sponsor even told me that last year, when the cheerleaders threw plastic footballs, one cheerleader tripped right before she threw it and beamed it (on accident) right into a kid's eye...the school had to pay a medical bill....so be DOUBLE warned! Just for fun today we got up and got ready for Will's 2nd football game while a monsoon was taking place right outside our front door. We kept waiting for the call to say the game was cancelled but we received nothing. So we left the house and Will immediately exclaimed that it looked like THE flood outside! We drove the 20+ minutes to the field, pulled into the parking lot and it was cancelled! :) Joy! So we went home and Caroline made her own ark, just in case she needs it! Roll up your pants and hang on tight...the water is rising! So Will is seven years old today. SEVEN years old! Oh my...where does the time go? Has it really been that long since he learned to walk, and talk, and started losing teeth and learn to read? Wait...he can read? Oh right...he can! I cannot believe he is seven. I thought I was old when I had him...now I am seven years passed that old feeling and feeling quite ancient, actually. How do you go from that cute little guy above to this big, grown up one? Happy Birthday sweet Will! It is truly a pleasure to be your mom! My little brother is getting older. In fact, today, he is only 10 years younger than me. Yeah, you read that right. I had the GLORIFIED position of being the baby of the family. I had two older sisters, but I was the baby. The baby….my dad had really wanted a boy but when I came along, he had to release the dream of carrying on the family name and pour all he had into his girly children. I took up the position of being the boy he always wanted (complete with short, boy-type haircut…thanks again for that mom!). I played sports, I cussed, I spit….just kidding. I didn’t play sports. Kidding again. I did play sports and I did try to be the boy… And for 10 glorious years, I held the position of baby of the family and held it well…then I got the news. Baby coming in September…and…IT’S A BOY! Oh no…not a boy…ahhhhh! He slid into that baby of the family position like he knew what it meant from birth. I have said for years that he is the golden child and I stand by that…and just now as I said that to you I remembered that I was supposed to send my little bro the garage door opener for mom and dad’s house like a month ago…whoops! I will get it to you soon….consider it your birthday present! Love you Little Bro…you are a great husband, an amazing father to two of the cutest kids, an uncle who “rocks” and a very loyal worker! Keep your boss honest! So we have been dealing with lots of illness at our house as of late. We have had Will and his dizzy spells last week (which ended up being a sinus infection…praise the Lord it was nothing more serious)…then Caroline decided to get croupy on us Sunday night. She is still fighting that and we are desperately trying to stay out of the doctor’s office as they are covered up in the flu around here (the flu-flu, not the H1N1 stuff)…and then Mark and I last night decided we were both too sick to do much of anything. I guess I decided I was sicker than he was because I went on to bed and cannot tell you what time the rest of my family laid their sweet heads down for the night. Will, by the way, won his scrimmage, but not before we had to do a little middle-of-the-game-wipe-tears-from-his-eyes-pump-him-up-pep talk! He is playing center (which for any of you like me means he snaps the ball) and apparently the cool thing to do if you are the other team is to line up your ABSOLUTELY LARGEST player across from the center and tell him to take him out. Now the center stands right in front of the quarterback, so he is really his first line of defense. Now, my kid is tall, one of the tallest on the team, but big? Thick? Strong? Yeah, not so much. He got his clock cleaned the first 3 plays of the game and came up after the 3rd play with his fingers in his mouth and tears rolling down his dirt stained cheeks. It did not help that the kid was throwing him down by his facemask and his neck…nor did it help probably that his parents were going ballistic on the sidelines—he eventually bucked up and started fighting back and the kid backed down. Will says he still wants to play so we shall see how that translates on Saturday morning for our first REAL game! So, Caroline was still not better yesterday and so I asked my sweet friend who is a nurse to check her out for me. Caroline wanted to know why “Urse Amanda” had to check her up! J I was worried (because Mark had gotten me all freaked out) about pneumonia…but never fear. She is fine and we just have to continue treatments as we have been….oh joy! I can hardly wait for the sass that comes with a few more days of breathing treatments! On a funnier note…Mark, with his COLD (because that is what we both have right now), crawled in bed beside me last night and TRULY asked me…”Do you think we have the swine flu?” I kicked him out. The Dawgs Choked but ROLL TIDE! So we went over to our friends' house for the first big night of college football. Mark, of course, is a Gamecock fan and his big night was Thursday night and I am a Tarheel, and my football team is rarely on TV here, but Greg and Dusty are neither and one of their teams was on last night. Dusty is a War Eagle, who married an Elephant and Greg has done to his two boys what I have done to Will. Brainwashed them big time. They are huge Bama fans...well, everyone but Dusty. You know, Auburn marrying Bama is almost as sacrilegious as a Tarheel marrying a Blue Devil. But I digress. We got over there for the kick off of the Georgia Bulldog game, Mark dressed in Oklahoma State colors, and this is what we found. Greg ran cable out from the house, brought out of storage a TV he had in college and set up reclining chairs for the boys to sit in for HOURS and watch college football. (and yes...I happened to take the picture when Lou Holtz, former Gamecock coach, was on ESPN...Mark said it was a good sign). The kids were occupied for the first 10 minutes with the mama cat/hunter extraordinaire and her precious two week old kittens. Mark tried to steal 'em before we left....not really, but he wanted to. We ate great food and settled in while the kids ran wild. They played in the new treehouse (which I incidently got NO pictures of...sorry Greg) and then grabbed guns and ran off to protect the homestead from intruders. Well, the boys grabbed guns, Caroline grabbed, well, a horse. She wanted a quick escape, I guess. Will took the first watch...that lasted all of about 10 seconds. Then John and Will tried to convince Max and Caroline that this work was better left to the elders of the group and that they, the young ones, should probably take cover in the unphotographed tree house. They did not buy it! We were not sure if Max was petting Caroline's horse here, or sizing her up for a smooch! So we called them in for dessert to distract him from the whole kissing thing! All in all, a great time was had by all! Mark finally has someone who shares his passion for football---screaming at the TV and whooping and hollering just like he does; Will found a new friend that has already, less than 24 hours later, invited him over to his house to play in the mud; Max may have found his "girl" and I, of course, already knew how much I liked Dusty! And the icing on the cake? The Dawgs choked and the Tide, Tigers and Tarheels rolled on victorious! OK...so I know it is only Saturday at 2pm, but I have some funny things to tell you. First of all, Will got a jersey from a great friend of mine that sported the local high school team on the front and Will's name on the back. He was so excited that he told me we HAD to go to the game because he had his new jersey to wear! LOL A boy after my own heart. He was waiting anxiously for Mark to get home and was ready to go as soon as Mark walked through the door. Mark came over to him and asked him if he had gotten his name on the board (He had not, and for the first time he went a whole week without getting his name on the board--forget that he was out on Thursday for a sinus infection)...anyway---Mark said to him, "Always stay such a sweet boy, don't drink, or smoke or do drugs...ever, ok?" Will looked at him, taking it all in and then panicked and said, "I can't ever drink again?!?!" I laughed so hard...he thought he was not allowed to ever have another thing to drink. We won't even talk about the fact that Mark wears this shirt ALL the time and I HATE it. Thanks a lot dad for bringing this home from the ACC Tournament. I am so sick of this shirt...I think I might burn it! Last night at the football game, Caroline was afraid she might fall through the crack of the bleachers and she said, "If I fall there, then my neck would break off and then you would only have to take care of my head, right?" Sure, babe! Then she said, "Mom, I wish my head was your arm." Caroline: Because then I could always be with you! Awwwhhhh...how sweet! She is already my constant shadow...not sure she could get that much closer! Caroline decided to dress herself today...she is wearing a skirt (that has attached shorts), jeans over the shorts part of the skirt and a blue shirt that is kinda big on her...she was adamant about wearing THIS outfit. So, we are going to watch some college football with some friends and I am bringing brownies and ice cream and homemade salsa. So Caroline snuck into the kitchen as the brownies were cooling and decided she needed to check and see if they were good enough to take. She deemed them great. I deem them embarrassing to take into public. 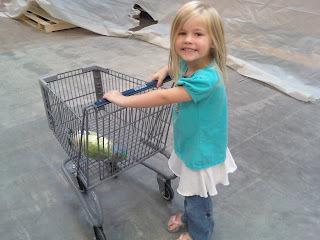 As her punishment, I made her go grocery shopping. Only it is not punishment for her...just me. She had the time of her life pushing her own cart. Thanks Kroger, for that...I really LOVE those tiny carts. I have had the absolute privilege of having the best dad ever. My dad has spent his life in service to others. He had a long and distinguished career in the army and went many times to fight for you and me to be able to blog in freedom. "If you don't want it read, don't write it. If you don't want it seen, don't do it. If you don't want it heard, don't say it." I still live by those words...sometimes...I really should try harder to .... but regardless it is the BEST advice. And he taught me how to see the good in all people. And I do mean ALL! Even those that could be deemed "Heavenly Sandpaper." He is upbeat and positive, full of love and ready to help anyone. He loves his grandchildren unconditionally and wishes his whole family lived down the road from him (or that is what he says anyway). He is good people and I am truly blessed!